The Bridgestone World Solar Challenge 2017 ended around 3 weeks ago. It was the first race our team has ever participated in. We were very fortunate to have very supportive sponsors who made this possible. 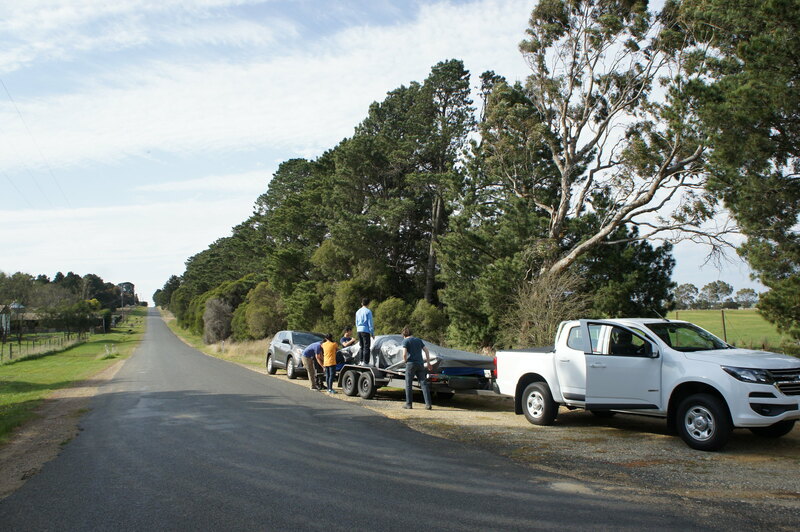 With this post (and more subsequent posts to come), we hope to give everyone a glimpse of what it took to bring Argo 9670 miles across the ocean from USA to Australia and 1860 miles across the Australian outback. 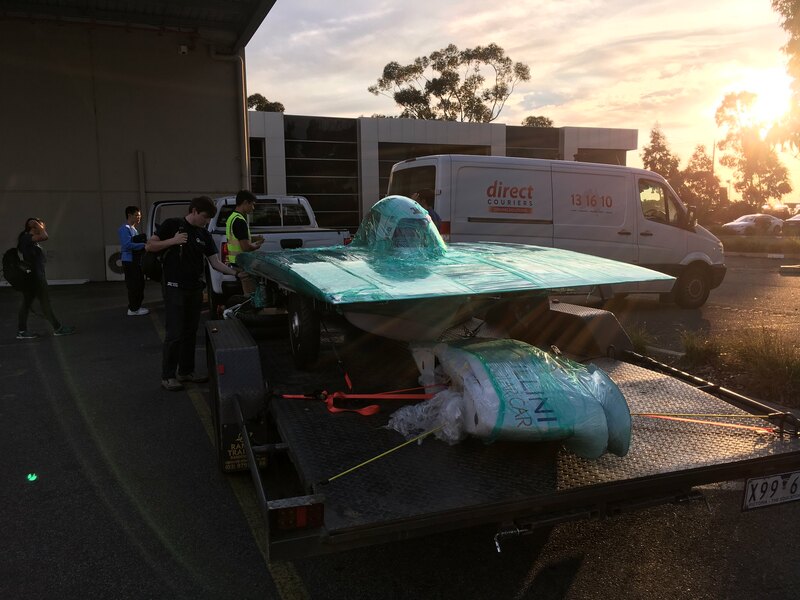 Part of the team arrived in Australia on the 20th of September, 6 days before the garages at the Hidden Valley Motorsports Complex became available for all teams. Due to various reasons (the main one being the lack of time to look for a logistic company who could ship Argo to Australia within a month and charge a reasonable cost), we had decided to ship Argo and a pallet of our stuff to Melbourne. A company would then help us to clear everything through the customs and bring them to a storage space nearby. We had expected Argo to be sitting at the storage space waiting for us prior to our arrival, but of course, nothing in the real world goes according to plan. Fortunately, after some phone calls we managed to have some quarantine officers inspect the crate and pallet 2 days later on the 22nd of September and (surprisingly) we passed the inspection smoothly! The first look at Argo nearly gave us a heart attack. Argo was damaged during the transit. Some bolts on the suspension assembly were broken and one of the ratchet straps holding down Argo was nearly broken. We did some further inspection on Argo but did not find any other visible damages. We had to make a decision: to switch out one of the worn out suspension parts (would have taken half a day - it was on a Friday afternoon so that meant having to wait until the next Monday before we can do anything), or to just replace the broken bolts and strap Argo on a trailer anyway and head for Darwin. We took a leap of faith and decided to just replace the broken bolts and trailer Argo to Darwin. 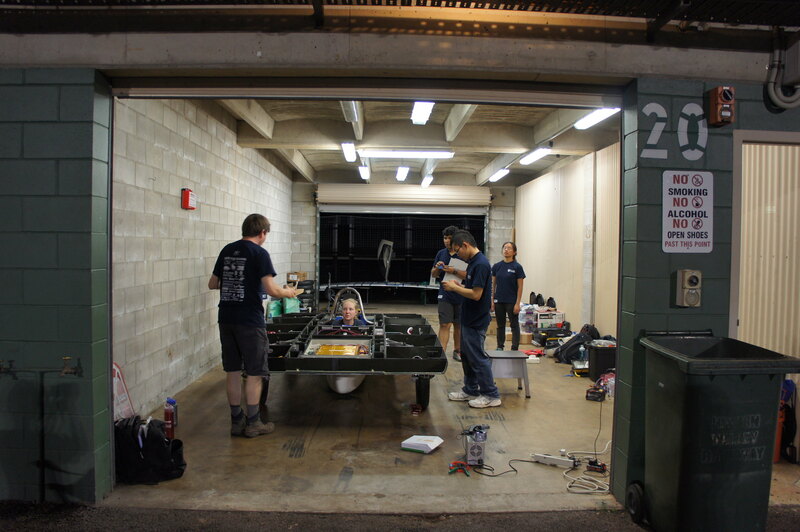 Losing 3 days would mean not having enough time in the Hidden Valley to prepare Argo for scrutineering and the race. 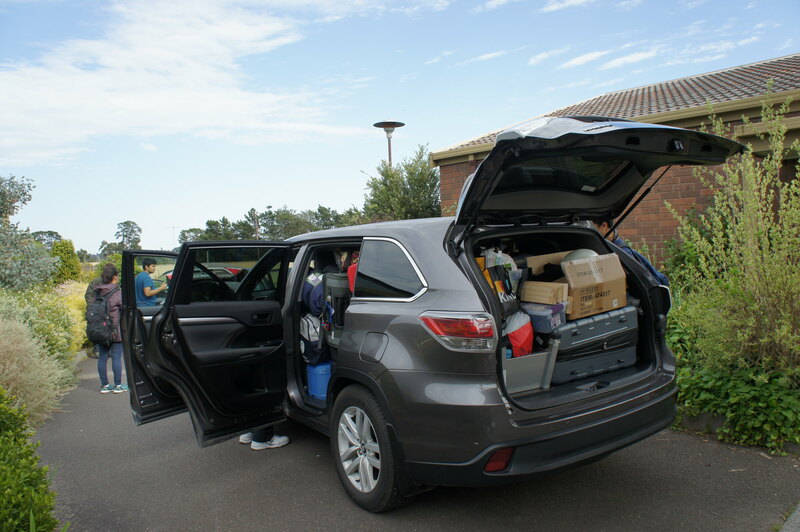 On the next morning we packed everything and started the long drive towards Darwin. 10 minutes into the journey, after making multiple wrong turns and having some radio communication issues with other vehicles in our convoy, we pulled over in a residential area and added some tarps over Argo. We had to stop countless time on that day (and on the subsequent days) to re-strap the tarp due to the wind. On the third day we finally made it to the outback. It was less windy there, and we passed by the Minnesota solar vehicle team! They were test driving their solar car across the outback. 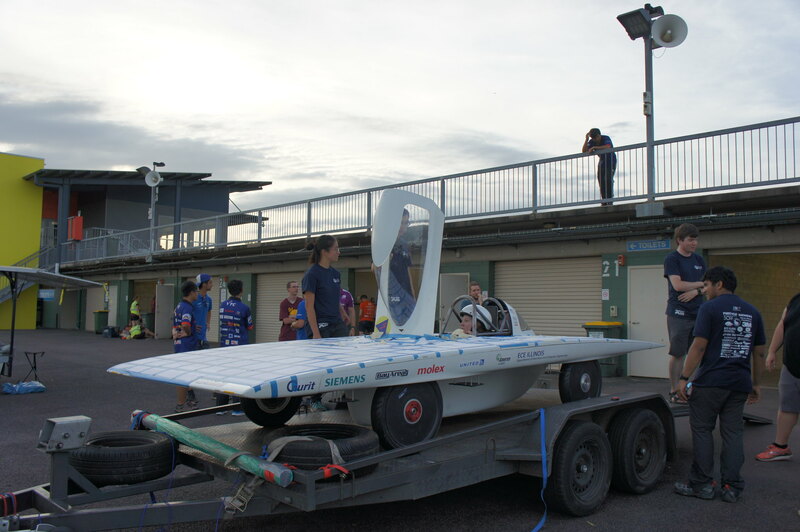 It was very exciting for us to see a solar car there for the first time! With the A/C at full blast we were still sweating in the car. 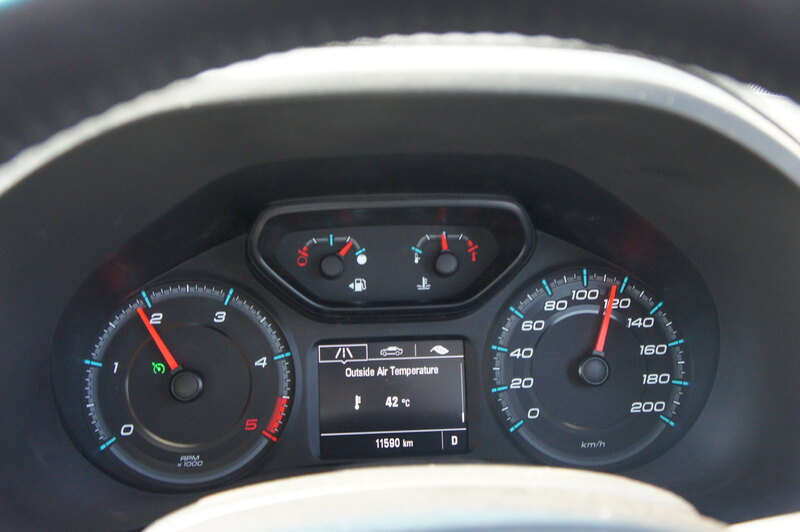 It was 42C, or 107.6F out there! As we exited the Southern Australia territory we also had to dispose of all fresh fruit and vegetable in a quarantine bin to help keep fruit flies out of SA. 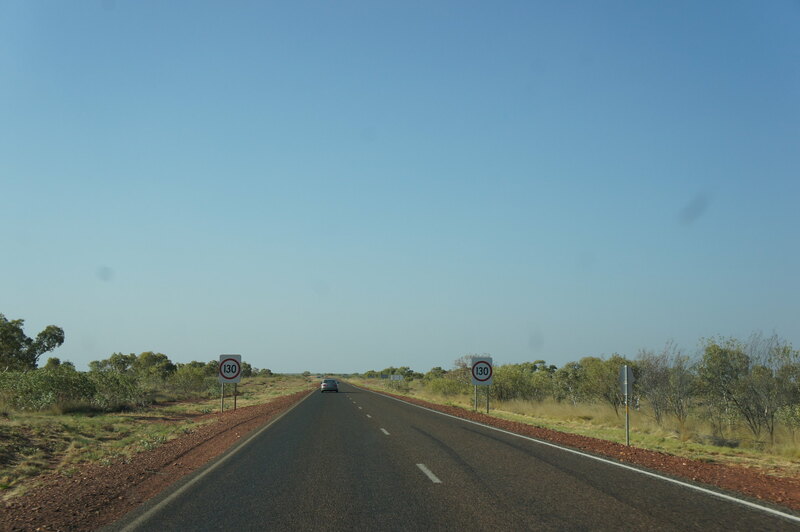 The speed limit increased from 110km/h to 130km/h as we entered the Northern Territory! On the 28th of September, which was two days after our scheduled arrival, we arrived in the Hidden Valley Motorsports Complex and were greeted by many other friendly teams! Each team could choose to have either a permanent garage space or a temporary space in a tent - we almost wanted to pick the latter and work at our Airbnb but chose the former in the end. Glad that we made that choice because we had a great time interacting with all other teams also in the complex! That concludes our arduous journey from Melbourne to Darwin! The trip was actually really helpful for a zero-experience team like us. 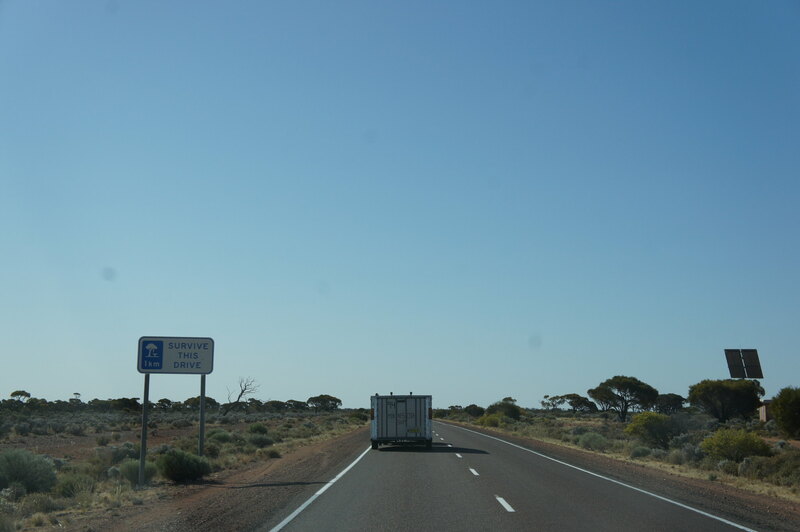 We got to experience what it's like travelling in a convoy, passing a roadtrain, camping by the side of the road, not showering for multiple days, etc. We also got to learn about the various defects of our radio equipment which had later caused a ton of issues during the race. *You can view more pictures on our Flickr album. Follow us on Facebook or Twitter to get more updates from us!